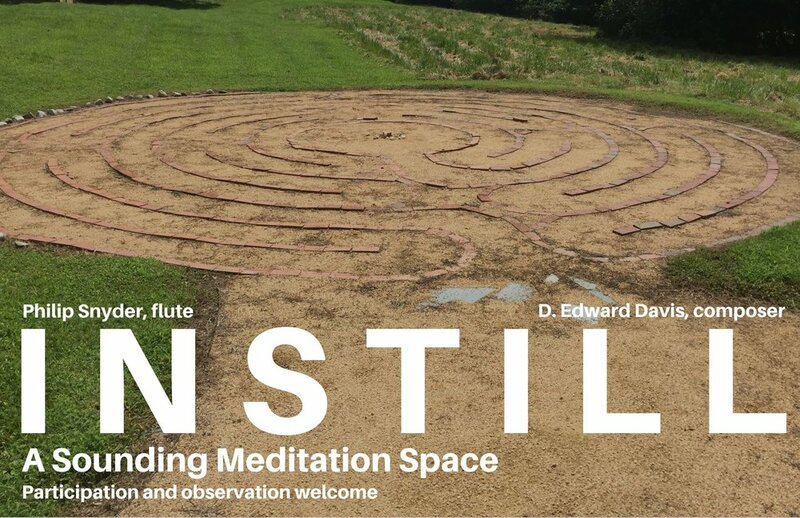 earspace presents its flutist, Philip Snyder, performing "instill" a sounding meditation space created by D. Edward Davis. Visitors to the outdoor labyrinth path will be invited to walk the maze while creating and interacting with sounds. Seating will be provided for those who wish to experience the event that way. Visitors are welcome to come and go as they wish. This performance takes place at the Duke Unicorn Bereavement Center, 1001 Corporate Dr., Hillsborough, NC. Tickets to this performance are free and open to the public. Recent performers of his work include F-PLUS, Polyorchard, [Switch~ Ensemble], trombonist William Lang, Verdant Vibes, the New Mexico Contemporary Ensemble, The Witches duo, Occasional Symphony, No Exit New Music Ensemble, Musica Nova, Callithumpian Consort, Yvonne Lam and Lisa Kaplan of Eighth Blackbird, the Williams College Percussion Ensemble, Soundry Ensemble, Red Hedgehog Trio, yMusic, the Duke New Music Ensemble, Da Capo Chamber Players, the Wet Ink Ensemble, violinist Mari Kimura, pianist Ingrid Lee, and flutist Dalia Chin and vocalist Kate McDuffie. His compositions are featured on the Spectropol Records compilation Possible Worlds, Vol. 2, and on recent recordings by The Witches (Behind the Curtain), Red Hedgehog Trio (10 x 10), David Thornton (Parallel Realities), Eric Honour (Phantasm: Music for Saxophone and Computer), and Erik Carlson (Music for Violin). As a performer, he is featured on the 2017 Irritable Hedgehog recording of Jürg Frey’s Buch der Räume und Zeiten and on Manfred Werder’s 2003released by Edition Wandelweiser. In 2018, Davis’s article “Environmental Dialogues: Conversations with Nature in the Music of David Dunn” appeared in Sound American (vol. 19), and his work imago hymns was published in the Spring 2018 issue of Computer Music Journal(“EcoSono Environmental Computer Music and Sound Art Compilation”, curated by Matthew Burtner.) Along with Jennie Gottschalk, he presented on “Ecology and Sonic Practice” at the Le Laboratoire ArtScience series in Cambridge, MA in May 2018. His scholarly work “The Map and the Territory: Documenting David Dunn’s Sky Drift” was published in Organised Sound (Cambridge University Press) in early 2017. He presented papers at the 2017 New Music Gathering in Bowling Green, OH and at the 2017 Sixth International Conference on Music and Minimalism in Knoxville, TN. Davis is currently a Practitioner-in-Residence at the University of New Haven and teaches composition at the University of Bridgeport. He lives in New Haven, Connecticut, with his wife Rosemary.